Say “hello” to your little one’s new favorite naptime accessory. The Wildkin children’s Original Sleeping Bag is soft and oh-so-cozy – perfect for daycare snoozes, slumber parties, and living room camp outs. Each Original Sleeping Bag comes complete with a matching standard size pillow case and storage bag. Lightweight and functional, the Original Sleeping Bag rolls up to fit securely into its coordinating elastic-close storage bag for the ultimate sleep-and-go experience. 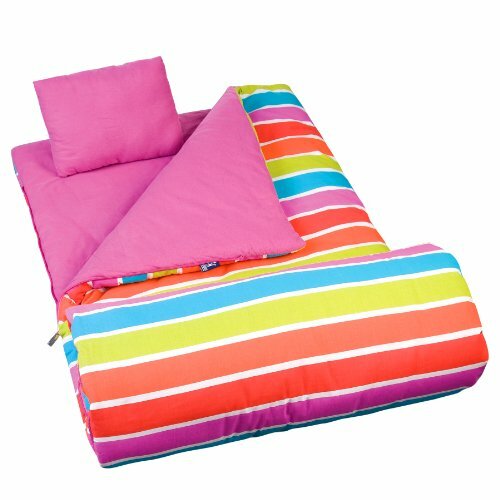 Wildkin’s Original Sleeping Bags measure 66 x 1.5 x 30 inches and are recommended for children ages 5+ years. Each sleeping bag is a high-quality cotton and super soft microfiber blend that has been rigorously tested to ensure that all parts are PVC, BPA, Phthalate-free, and conform to all rules and regulations set forth by the Consumer Products Safety Commission. Machine wash in cold water on gentle cycle in front loader washing machine only. Hang to dry. Machines with an agitator can disturb the filling distribution in the sleeping bag and cause it to no longer lay flat and even. Not intended for outdoor use.